Hypobaric Storage in Food Industry: Advances in Application and Theory presents recent examples of hypobaric storage implementation. The book covers examples including hypobaric warehouses in the United States and China; the results from extensive Chinese publications, some addressing military use; improved design of an intermodal container to reduce cost, weight, and power consumption; and a proposal to fabricate a container in China for shipping mangoes and other difficult-to-export plant commodities. In1979 the Food Technology Industrial Achievement Award was given by the Institute of Food Technologists to the Grumman Corporation and the Armour & Company-Research Center for their creation of a hypobaric transportation and storage system that extended the storage life of fresh meats and plant commodities six times greater than average. Since then, cost, experimental errors by academics, and other concerns have prevented hypobaric storage from achieving more widespread adoption. However, recent advances — particularly since 2004 — have brought hypobaric storage back into active research and development. 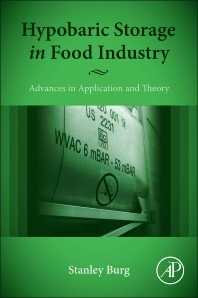 With specific focus on issues such as condensation; insect, fungi, and bacterial contamination; and materials and methods, this work lays out hypobaric technology for readers including students of postharvest physiology, agricultural engineers, and producers and exporters of food products.